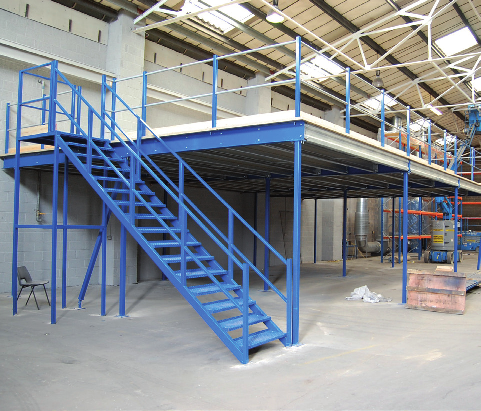 A mezzanine floor is a quick & easy way of utilising the available height of a building, by doubling or even tripling the available floor space. Installed quickly & cost effectively, a mezzanine floor can prove to be a rational alternative to relocating your business or expanding your premises. Mezzanine Floors are typically designed as free-standing platforms & comprise cold rolled galvanised secondary floor beams bolted into the main universal beams, in turn supported by rolled hollow section steel columns. This structure is topped with a tough 38mm thick tongue & grooved particle board, although we can provide alternatives when required. 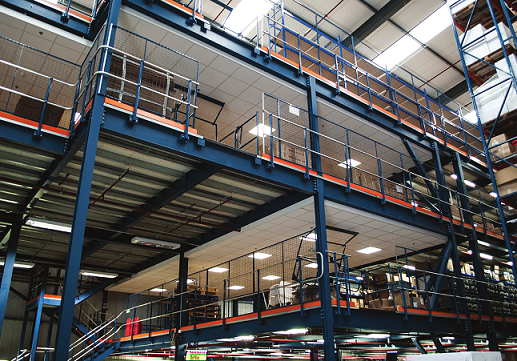 Installing a mezzanine floor is an ideal way to solve any storage issues that your company might have. Shelving & racking can be installed on the storage level, or it can just provide a new storage platform for palletised goods. By utilising the available headroom in your premises with a mezzanine floor, additional office space can quickly be created. This is a relatively cost effective solution, allowing a business to increase its headcount, under the same roof! 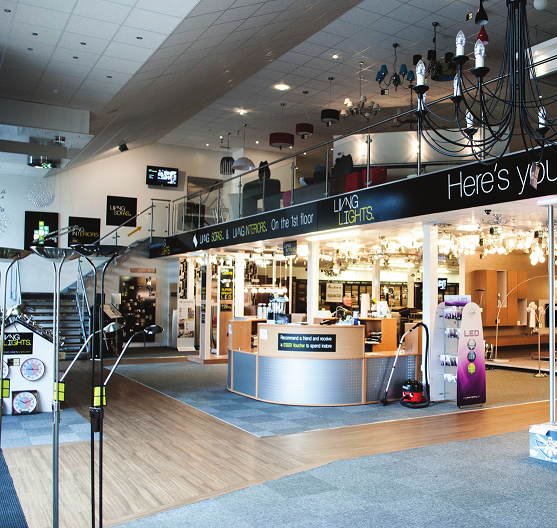 A Mezzanine floor can be used to increase retail floor space. 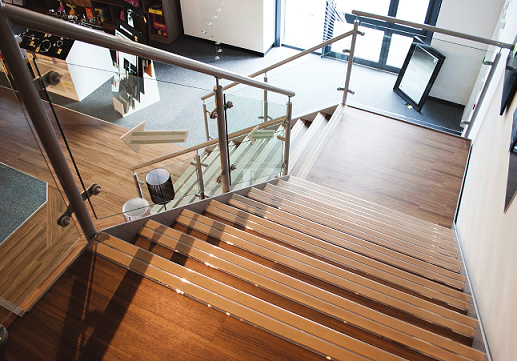 Our floors fit seamlessly into a retail space, and we have a huge selection of high quality decking, staircases & handrail options to choose from. We will make sure that your new mezzanine floor is designed in compliance with all the current Building Regulations, British Standards & best practice guidelines. We will submit the plans to your Local Authority/Approved Building Inspector, to getapproval and all the required consents. We will also ensure all the necessary Fire Regulations, health and safety & access regulations are taken into consideration when we are designing, manufacturing & installing your mezzanine platform. A staircase can either be a functional part of your mezzanine floor or it couldact as an inviting feature of it, alluring customers and clients to explore youradded level. Whatever your need is, our designers and safety experts areavailable to offer more information and talk you through all the features, design options, regulations and requirements of your staircase. We offer a wide range of mezzanine floor decking designs and styles,whether for retail, office accommodation, storage platforms, industrial or for tiered structures. We will consult with you to ensure that suitable decking is installed to your mezzanine floor to fit with its function or the image that you require. All mezzanine floors require edge protection to all exposed edges for safety purposes. We offer a wide range of handrail options with different styles, colours and finishes suitable for retail and industrial settings alike. In some cases, where a mezzanine floor is used for storage purposes only, fire protection is not required. However, if the platform exceeds certain size parameters, or when people are occupying the mezzanine floor on a continual basis, then suspended ceilings, column casings and smoke detection will be needed to comply with building regulations. Pallet gates are designed to allow the loading and unloading of pallets and stock safely. Our pallet gates are designed so that no edge is ever left exposed, heightening the safety of those operating it. 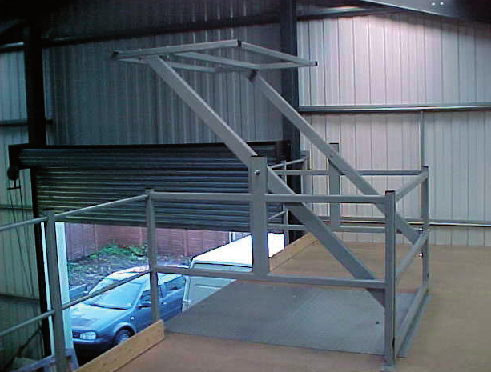 This ensures that staff using a pallet gate at the edge of a mezzanine floor, are always safely behind a handrail. Robust and easy to operate with an up and over lift system our pallet gates are the easiest and safest addition to an industrial or storage used mezzanine floor. Whatever your requirement we welcome the opportunity to visit your premises,assess your needs and provide a full CAD design service and quotation completely free of charge.